"One day... I'd like to work there." 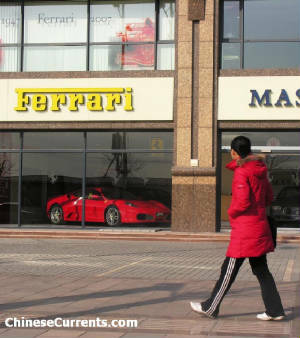 Wherever you go in China, you are likely to be not far away from a salesperson. Twenty years ago you could wander around any shop or public place unhindered (or unloved, depending on your state of mind). These days, spurned on by commission structures that can make a huge difference to their pay, salespeople tend to take a keen interest in any prospective customer. The good ones have also worked out that professionalism, enthusiasm, knowledge and a "good ear", are more likely to impress than "in-yer-face" persistence. 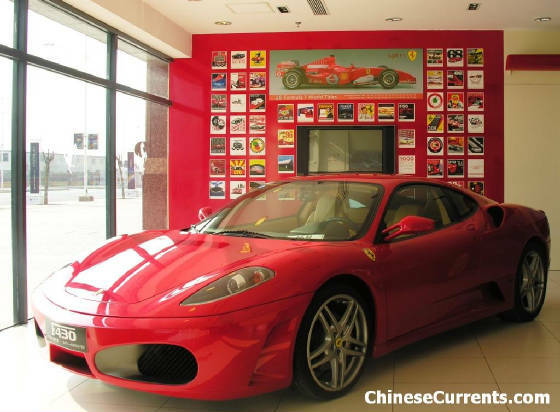 At the professional end of the scale, its hard to imagine a more impressive ambassador for a brand than Cherry, at the Ferrari dealership in one of the "Bohai cities". I've never fancied a 430 myself - the sea air of my hometown would turn the "Ferrari Red" into a "Barbie pink" in no time – also I would prefer to keep the arm and the leg they would cost where they belong. Cherry told me that it could be mine for 2.8 million yuan. In other words you would just about be able to buy a couple of car seat covers with the change from 200 thousand pounds sterling. She very kindly offered me a coffee – but it really must have been out of the kindness of her heart, because the well-worn fleece I was wearing was a dead giveaway that I was the type of chap who only keeps Ferraris in the garage of his mind. “What kind of person buys a Ferrari," I asked. 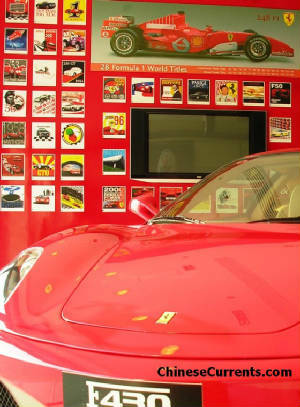 Most people who buy Ferraris, it seems, pay by credit card. I asked Cherry about herself. She told me that she is from a city several hours by train north of here (I passed through it a few days ago). She came to study at the top university here, where she graduated with a degree in history. “Do you have a car?”, I asked. “Do you have a one?”, she asked. “Yes, similar to this one”, I said, pointing to the Ferrari. She realised that I was of course joking. “In what way similar?” she asked with a smile. “If you don’t have a car, then what do you like to spend your money on?”, I asked. The vast majority of young people live with their parents until their late 20s, usually until – or even after – they’ve got married; but increasingly young people are renting and even buying there own property. But the young people who have moved away from their hometown for economic reasons have no choice – they have to find a place (quite often with friends in the same boat). But Cherry’s situation is, of course, not typical. I was polite enough not to ask her how much commission she received per sale, but it was clear that a Ferrari salesperson earns more than Starbuck’s waitress. “Wow,” I said. I’m sure the place has increased in value since you bought it. She beamed. “It certainly has. I bought it in 2004 with a 15 year mortgage. Since then it has doubled in price”. “What brands do you like,” I asked. That is clearly the case. She wore a very smart pin-striped charcoal two-piece suit, a white silk blouse with a leather tie-up holding a silver pendant. Her hair, naturally black, literally shone under the bright lights of the dealership. “I can’t afford the brands I really like,” she confided. "Why do you like LOU-IS VUIT-TON?" I asked. "Because of its history. I love its history. Its SO Romantic."